The $40 Motion Digitizer Pen ships with five replacement nibs and an extraction tool. Motion Computing markets a line of rugged Windows 8 tablets aimed at professionals in medicine, construction and other industries. The products must be pricey because their website doesn't list prices and they only sell through value added resellers (a quaint throwback to the pre-Internet stone age, imho). Though you wouldn't know it by reading any of their specs, some of the penabled Motion tablets use Wacom technology and their LE-series pens are compatible with the Surface Pro. I ordered one to check out and really like it. 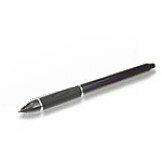 At 5.71” long x .43” diameter (144mm x11mm), the pen is significantly longer than the standard pen and the Wacom Bamboo Feel without its cap. Although it's made of plastic and light weight (.54 oz / 15 grams), the Motion pen flares out toward the tip and has a nice rubberized section that makes it very comfortable to hold steadily. It also has a recessed button which minimizes accidental presses. The six nibs that ship with the pen are not as soft as Wacom's textured nibs, but they offer a nice amount of resistance against the Surface Pro's screen. Some of you may disagree, but I don't like hard plastic nibs that reinforce the sensation of gliding on glass. Although the rear of the pen looks like it might be an eraser tip, it's merely an eyelet for threading with a lanyard (very handy if you're using the pen in the field in one of those hectic professions mentioned above). CORRECTION 12/12/13: Thanks to reader Chris Howard, I retested the eraser tip on the Motion Computing pen and it does work on the Surface Pro. I can't say why it didn't during my initial testing. Thanks, Chris! The stylus doesn't ship with any kind of a cap, which unfortunately leaves your pen nib susceptible to damage in your bag or pocket. Also missing is the second button many of you are clamoring for; I've yet to find this elusive beast but promise to keep searching. For approximately $40, the Motion Digitizer Pen is definitely worth considering and may actually become my favorite. The Motion Digitizer Pen (bottom) compares favorably to the standard Surface Pro pen and the much more expensive Wacom Bamboo Stylus Feel - Carbon.